The assessments made in Johannesburg are shown on Figure B4.10, together with the mean and values half and two standard deviations from the mean. 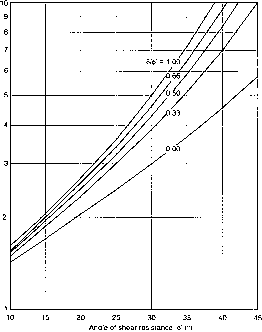 The assessments cluster around half a standard deviation from the mean, as suggested by Schneider. Comments from the audience were that they felt that the assessment they had made was essentially the same as they would previously have made in geotechnical design practice. The same audience was then shown Figure B4.ll. Again the reader is invited to make an assessment of characteristic value. The Johannesburg results, shown in Figure B4.12, were more uncertain in this case, despite the fact that the data had the same mean and standard deviation. Engineering experience was suggesting that the low values on this graph could not be dismissed so easily. This experiment is considered to support the idea that 'half a standard deviation from the mean' is a useful guide, whilst also suggesting that a reliance on statistics alone would be dangerous. It was noted in B4.2 that EC1,5(2) defines characteristic values for stiffness to be mean values. The context of this definition is probably ULS structural design, in which values of stiffness are needed for analysis, but they rarely play a dominant part in determining the occurrence of a limit state. In problems involving ground-structure interaction, however, the stiffness of the ground is often a very important parameter. In these cases, the use of a mean value for stiffness is questionable, since the calculations would then imply a 50% probability that the limit state would be exceeded, for the given design loads. If the limit state under consideration is a SLS for which displacements are being derived, partial load factors would be unity, so displacements calculated using a true 'mean value' stiffness would be best estimates, with no reserve of safety. In design practice, engineers rarely take this approach, preferring to make a more pessimistic estimate when there is significant uncertainty. EC1,5(2) is under review in the light of the foregoing reasoning (early 1998). EC7-1 therefore uses the same definition of characteristic value for stiffness as for strength. That is, a cautious estimate, not a mean value. In assessing the occurrence of a limit state, a further parameter is involved, besides stiffness. This is usually a 'limiting value' of displacement or distortion (EC7,2.4.6). It would, in principle, be possible to include sufficient conservatism in the specified limiting value that the actual occurrence of limit states could be made 'sufficiently improbable', even though mean values were used for stiffness. However, this would mean that the limiting values should be chosen in relation to the level of uncertainty of ground stiffness, which is somewhat irrational. EC7's definition of characteristic value also applies to the unit weight of soil and rock. However, the uncertainty about unit weight is usually sufficiently low that there is no need to make a distinction between mean and cautious values. For fill materials behind retaining walls, special checks are required by 8.3.1.1. Variability of unit weight is considered further in B5.4.2. The adoption, meaning and purpose of'Cases A, B and C' have competed with characteristic values to be the most debated aspect of EC7. The cases are sets of partial factors to be applied to actions and to soil material properties. Their function is similar to the 'load cases' familiar to structural design, but their scope is extended to include factors on soil materials as well as loads. All three cases refer to design calculations for ultimate limit state, and values of the partial factors are given in the Table below (taken from Table 2.1 ofEC7)]. Cases A, B and C are first defined in Eurocode 1, Table 9.2, which is reproduced as Figure C2.1. This comes in the middle of a section which deals with combination rules for actions (ie load combinations), and the three cases supplement these, rather than providing an alternative. Table 9.2 of EC1 has some important footnotes which will be discussed later. The origin of Cases A and B lies in structural engineering codes: they are the load combinations considered for 'stability' and 'strength'. In this structural context, 'stability' refers to situations in which loads balance each other so that there is negligible reliance on the strength of a structure for safety. Typical structures of this type include canopies, and many structures during construction, including both structural frames and balanced cantilever bridges. Case A is derived from such 'stability' considerations, requiring a reduction factor to be applied to weight which acts in a stabilising manner. In the majority of structures, structural strength is a dominant feature in ensuring safety, and for these the partial load factors of Case B are similar to the basic requirements ofBS 8110. Case C came from earlier drafts of Eurocode 7. It has a unit factor on permanent loads (generally weight) and a relatively small factor on variable loads. EC1 and EC7 in combination make it clear that in Case C the main factors are applied to the strength of ground materials. Thus, in Case B the non-unit factors are all on loads and in Case C mainly on ground strength. In all three cases, the values of partial factors to be applied to strength of structural materials are to be taken from the other Eurocodes, as relevant; they do not, in general, vary between cases. The use of the three cases in EC1 Table 9.2 came about largely to assist integration of EC7 with the other codes, and EC7 therefore follows the concept of the three cases. However, it uses Case A in a special way by applying it to potentially buoyant structures, which depend on a balance of weight and water pressure, often with ground strength playing only a minor role. EC7 recognises that there may be many situations which depend largely on the balance of forces, but in which soil strength nevertheless plays a role. So, even for Case A, partial factors are applied to the strength of ground materials. An example of the use of the three cases in checking the ultimate limit state of a simple, potentially buoyant structure is given in E18. The reader may find it helpful to refer to that example to clarify the concepts described above, before studying the rest of this section. In most situations, it is found that when geotechnical calculations are carried out to determine the required geometry of foundations or other structures, Case C is critical and therefore determines the geometry. Similarly, it is most often found that Case B governs the structural design. Engineers involved in the development of Eurocode 7 are concerned that the use of the cases will require some additional calculations, at least until the user has sufficient experience to be sure which calculations are critical. There would clearly be advantage in reducing the cases, particularly B and C, to a single case. This might be achieved during further development of EC7, but the situation at early 1998 is that opinion is split fairly evenly as to how this might be done. Some engineers argue for omission of Case B entirely, whilst others would prefer to use only Case C for geotechnical design (giving the sizes of structures) and only Case B for structural design (checking their strength). Still others would omit Case C entirely. It is fairly clear, though still debated, that ENV 1997-1:1995 requires that, in principle, all designs must comply with all three cases in all respects, both geotechnical and structural. The authors recommend that this be accepted until a better approach has found broad agreement. The concept of load cases is familiar in structural design. It is normal that these require several sets of calculations, only one of which will prove to be critical and so govern the design decision. Thus, in the calculations, each structural element may be at a limit state for one load case but will not be at limit states for others. The basic requirement is that it does not exceed a limit state in any of the calculations. In structural design, some, perhaps almost all, of the cases can often be dismissed by inspection as being not the most critical for a particular calculation. It is only necessary to carry out calculations for those cases which might prove to be the most critical. The 'cases' used in EC1 and EC7 have the characteristics ofload cases described above. In addition, however, the partial factors applied to ground strength are varied between the cases. Several key elements of the relation between EC1 and EC7 are contained in the footnotes to EC1 Table 9.2. Footnote 1 requires that The design shall be verified for each case A, B and C separately as relevant. The term 'as relevant' has caused much debate. One interpretation, favoured by some, is that only Case B is relevant to structural design and only Case C to geotechnical design. However, it will be noted below that this leads to confusion in some cases, and possibly to over-optimistic design in others. EC7 repeats EC1 Footnote 1 in 2.4.2(12)P. Paragraph 2.4.2(15) says that Where it is clear that one of the three cases is most critical to the design, it will not be necessary to carry out calculations for other cases. However, different cases may be critical to different aspects of a design. The clause then gives guidance on what aspects, both geotechnical and structural, of various types of design are most likely to be governed by one of the three cases. From this it is clear that EC7 requires that, in principle, all designs must comply with all three cases in all respects, both geotechnical and structural. That is, the cases are treated exactly like load cases, as discussed above. Calculations need only be prepared for cases which cannot be dismissed as obviously 'less critical'. it would be irrational to factor the disturbing and restoring components of the same pressure differently. For retaining walls, Paragraph 2.4.2(17) ofEurocode 7 effectively defines 'the ground' as one source. That is, it says that All permanent characteristic earth pressures on both sides of a wall are multiplied by [1.35] tfthe total resulting action is unfavourable and by [1.0] if the total resulting action isfavourable (authors' emphasis). Since the term 'earth pressures' is defined, earlier in the same clause, to include water pressures, it is clear that this factor of 1.35 applied to all earth pressures will have the effect of increasing bending moments and shear forces in the same ratio. Paragraph 2.4.2(17) accepts that in some cases it is physically unreasonable to increase earth pressures, especially water pressures, by the factor 1.35. For these situations, EC7 allows the alternative of carrying out the calculations using unfactored characteristic earth pressures, then multiplying resulting bending moments and internal forces by 1.35, for Case B. EC7 says that this treats the factors on actions in EC7, Table 2.1 as 'model factors'. Although the statements in 2.4.2(17) are restricted to earth pressures, the authors recommend that this approach can be used more widely, but only where direct application of the factor to earth pressures or to weight of earth leads to forces which are physically unreasonable. Footnote 5 of EC1 Table 9.2 acknowledges that the factors applied to ground properties in Cases B and C may be different, as is required by EC7 Table 2.1. Footnote 6 confuses matters, however, stating that the use of design ground properties may be introduced in accordance with ENV1997 instead of using yG [1.35] and y^ [1.50]. These words effectively describe Case C, which is presented as an 'additional', rather than 'alternative', requirement in EC7. Footnote 6 notes that a model factor may be used with Case C, and this possibility is also mentioned in EC7. Paragraph 2.4.2(15) says that a model factor may be introduced as relevant for structural design, and a similar statement is made in 8.6.6(4) in relation to retaining structures. However, no boxed values are offered for these factors and none are supplied in the British NAD. Information on the possible future use of model factors is included in D2.2. The only specific value attached to a model factor in EC7 is the use of [1.35], noted above, where it would be physically unreasonable, in Case B, to multiply earth and water pressures by this factor. a the need to have equilibrium in structural calculations, and b the possibility that one case alone might be lead to over-optimistic design. There has long been controversy over the choice of the factors 1.35 and 1.5 for structural design. Some geotechnical engineers have argued that factors on weight should always be 1.0, and this view is supported by some structural engineers in the UK and, more generally, in Scandinavia. Simpson (1992) suggested that the factor 1.35 may be reasonable, in structural design, if it is viewed as an allowance for uncertainty of load path as well as of weight itself. The same paper argued that the factor 1.35 was not relevant to geotechnical design, but the considerations presented below are now thought to outweigh this view. There is no real prospect that the factors 1.35 and 1.5 will be changed in Eurocodes 1 to 4, at least, or in their NAD's for most countries, including the UK. It is therefore necessary that EC7 enables designers to complete the design of structures in which these factors have been applied to loads in the structural calculations. This becomes impossible if the geometry of the structure cannot provide equilibrium, at its interface with the ground, with these factored loads. Similar problems may occur for other structures subject to large lateral loads, such as chimneys and bridge piers. For retaining walls, the problem • becomes worse when there is water pressure in the backfill, or fill of low density or low angle of shearing resistance is used. A further example involving a tension-piled structure is noted in E12. Problems of this type only affect a minority of designs, but they occur sufficiently often to require that they are accommodated by the basic approaches ofEC7. Few engineers who have studied this problem would argue for omitting Case C and using Case B alone. Since the strength of soil is generally derived from friction, simply increasing its design weight, in slope stability calculations, for example, provides no safety margin. In principle, it might be possible to determine which zones of soil have a net disturbing effect and which a net restoring effect, and to factor the unit weights of these separately, but in practice this would be very difficult. In any case, the idea of factoring the unit weight of ground has little appeal as it leads to situations too remote from reality. Similarly, for foundations subject mainly to permanent load, if Case B is omitted, the factor of safety on some structural stresses falls to unity for ULS design. (Shear stresses in spread foundations are one example.) It is clear that this approach cannot be acceptable to structural designers and could not be agreed with the drafters of the other Eurocodes.